Minor dramas see plenty of yellow, tent on track, Nissan leads, Porsche bump starts Lexus! The #2 ESM Nissan DPi is out after contact with the #90 Cadillac into the very first corner left Olivier Pla with broken gearbox internals. The #64 Scuderia Corsa Ferrari is also a retirement after Frankie Montecalvo was an entirely innocent victim of an incident that saw the 488 roll on the exit of T17 after contact with Sebastien Saveedra’s #52 Ligier as he spun out having lost control over the bumps. The #3 Corvette is back out and running, albeit 18 laps down on the GTLM class leader after hitting battery issues. Nico Lapierre started the hour with a renewed attack on the lead, closing in fast on Eric Curran, Jordan Taylor also closing in in third in the #19 WTR Caddy. Joao Barbosa emerged from the pits on Lap 96 right in front of the lead trio, holding up Curran enough for Lapierre to get alongside, but he couldn’t make it stick and came perilously close to losing second to a Taylor. Curran pitted next time around, Lapierre to the lead in the #22 ESM Nissan. In GTD Corey Lewis was reeling in class leader Sheldon van der Linde. The Paul Miller Huracan having a little more pace than the Land Audi as the race moved into the fourth hour. Lap 99 and Taylor led as Lapierre pitted from the pitlane until he, in turn, pitted, the team again adding water and again seeing a stream of excess fluid spray across the pitlane. Tristan Nunez cycled round to the lead for a lap or two in the #77 Mazda as the order behind for those frontrunners having made their latest stops shuffled, Lapierre ahead of Taylor by some 8 seconds, Mike Conway now aboard the #31 right behind the WTR man. The #10 though was soon back down pitlane for more water to be added, that hot overflow taking more from the system than anticipated it seems, dropping Taylor back down the order to 6th, Conway to second. In GTLM the top three, James Calado, Sebastien Bourdais and Patrick Pilet were coming together, 5.4 seconds separating the trio just after the half hour point but that gap was coming down. Helio Castroneves was the next to make a significant move the #7 Penske Acura man going by Tristan Nunez’s #77 Mazda and up into third, Nunez though was soon onto pit lane, the Mazda apparently in some trouble, almost immediately confirmed as rear braking, the team working to fix it. In GTD it was still the #29 Audi (no with Picariello at the wheel) ahead of the Huracan (Sellers) the cap ebbing and flowing around the 6 second mark. As one Mazda stumbled the other was charging, Tincknell into the 1:49s and looking to close down Jordan Taylor ahead, 4.5 seconds the gap at the 45 minute mark in the fourth hour. Conway meanwhile was closing fast on the leader, under 2 seconds by Lap 115. Nunez’s stop meanwhile continued, the Mazda now dropping into and down through the GT order. 9 minutes to the top of the hour and the race went Full Course Yellow (only the second of the race) as a spectator ‘easy-up’ was blown by a gust of wind onto the track. The caution fell beautifully for Helio Castroneves as he pulled onto pitlane as the flags began to fly, he would emerge in seventh, but the remainder of the field would. As the pitstops began there was a front bodywork change for Ryan Briscoe’s #67 Ford. The CJ Wilson Racing Acura was also behind the wall for front end repair after their pitlane misadventure, the #36 rejoined after losing 8 laps. Also back in action was the #77 Mazda, Rene Rast back on track after the car suffered a 24 minute delay. Castroneves meanwhile cycled round to the lead and when the race went back to green got a fantastic restart after a 17 minute caution period. It was the opposite side of the coin though for Alex Brundle, having got back a lost lap under caution the #32 spun around into T17 as he tried to get by the GT runners and onto the tail of the Prototype train, Brundle keeping the car out of the wall but then unable to refire the car. He eventually got the car fired, but not before another Full Course Caution came out, number three, That lasted only for a couple of laps, back to green again. In GTLM Gavin had also managed to get in for a stop before the second FCY, that saw him climb from 8th to first. The sister car was back on track after a further lengthy (40 min plus) stop for a slipped alternator belt, it is not their day it seems. Behind him there was contact between the #24 BMW (Edwards) and the #66 Ford (Mueller), the M8 losing a headlamp cover. 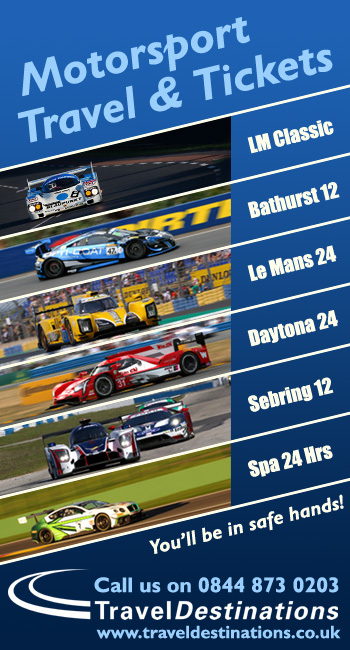 The #24 was soon in further trouble though. (clarification – Mueller hit the rear of the #15 Lexus at the hairpin and was then collected by the BMW). It was all change too in GTD with Jeroen Bleekemolen to the lead in the #33 Riley Motorsports AMG ahead of both Lexus, #14 in the hands of Frommenwiler, #15 with Jack Hawksworth at the wheel. With the BMW getting front end repairs the victim of the assault, the #66 Ford was next in, a shredded left rear and rear deck damage at least for Mueller. The Ganassi team employing the gloriously simple tool that is a big hammer to tease the supporting structure back into place! The car though would soon be behind the wall. Full Course Yellow number 4 meanwhile came out for debris on the start finish straight. With the rapid fire cautions (plus several cars hitting trouble, and each other, the order in all three classes was mildly shuffled as the field dusted themselves down and waited for the green. 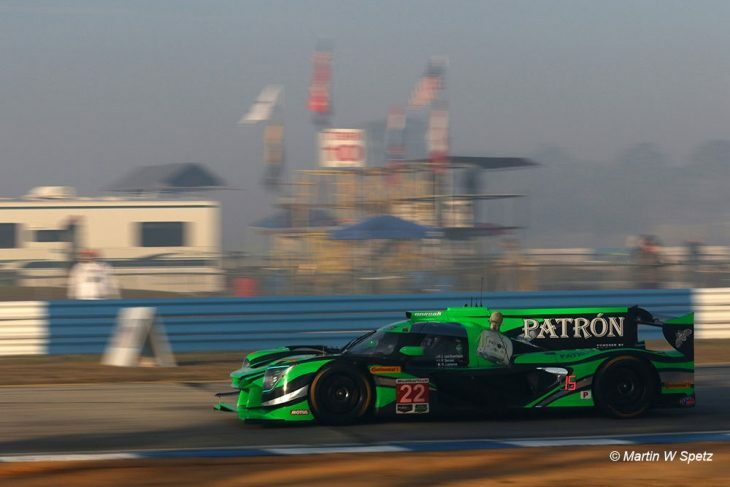 In Prototypes Pipo Derani had leapfrogged Castroneves, the #22 leading the #7 and #5. In GTLM Oliver Gavin still led but Patrick Pilet (#911) was second with Scott Dixon in third the #67 Ford. GTD saw the #86 MSR Acura lead in the hands of Alvaro Parente ahead of the Paul Miller Lamborghini (Bryan Sellers) and Lawson Aschenbach (#93 MSR Acura). Back to green after a 13 minute caution but there was trouble almost immediately for Christina Nielsen in the #58 Wright Porsche spinning in T17 as the field came around for the restart, she would make it back to pitlane without a further caution being required. The #52 AFS/ PR1 Ligier, in the hands of Roberto Gonzales was dealt a 3 mins 40 stop and hold after taking a wave by without being instructed to do so, the car though was already in the midst of a long stop, their time at the sharp end of the field looks over here. The #24 BMW meanwhile was back into the race after over 20 minutes behind the wall. Patrick Pilet made his way to the GTLM lead, getting the #911 Porsche by Gavin’s Corvette and managing to pull away. Rene Rast was hammering on after the substantial delay for the #77 Mazda, a 1:49.1 as he looked to chase down the first target that was the #85 JDC Miller Oreca, but only for 19th and still 8 laps down on the leaders. In the melee of FCYs meanwhile Alex Brundle had put the United Ligier back onto the lead lap! Up front as the end of the fifth hour approached it was still very close as the leading giggle of DPis dealt with traffic, Derani 2.8 seconds ahead of Castroneves who had Filipe Albuquerque in his mirrors the battle for fourth was also well alight, Dane Cameroon in the #31 just ahead of Mike Conway (#31) and Jonathan Bomarito (#55 Mazda). Into the sixth hour and Bryan Sellers was up into the GTD lead having gone by Parente’s #86 MSR Acura at the very top of the hour. Dane Cameron opened the hour fending off Mike Conway, the #6 Acura just ahead of the #3 Cadillac. Oliver Gavin pitted the second placed #4 Corvette, ceding the seat to Tommy Milner. Rene Rast, having closed to just seconds behind Trummer was back in the pits for a 4 minute stop, its not their day it seems! There was better news for the tam car though, Bomarito going inside Conway at T1 on lap 150 to take 4th overall, Albuquerque pitting from third. That started the leading group of Prototype stops, Conway and Cameron the next to pit, Hunter Reay and Cheever following next time around. The GTLMs too were starting their next pit cycle and that put Alexander Sims in the #25 BMW into the led for a while as Pilet (handing over the #911 to Nick Tandy) and Dixon (staying aboard the #66 Ford) both went for service. The top three pitted after lap 152 together with fourth placed Alex Brundle, quite a recovery after the spin and stall rather less than an hour before! Paul di Resta would take the wheel of the #32 Ligier and would emerge still as leading P2 car, 9th overall. The Land Audi was latest onto the naughty step, fire extinguisher not properly manned at the stop where Christopher Mies took the wheel, they’d be dealt a drive-through. GTD meanwhile has a top four separated by some 30 seconds with Frommenwiler leading in the #14 Lexus, 2 seconds ahead of Ben Keating’s #33 Mercedes-AMG with David Heinemeier Hansson’s #15 Lexus 10 seconds back and Cooper MacNeil in the surviving #63 Scuderia Corsa Ferrari 17 seconds back in fourth. Keating would lead the class as the #14 Lexus pitted almost on the half hour. Dominik Baumann climbing aboard. Approaching the half hour mark and Derani was pulling away, the lead over 10 seconds on lap 157 with Albuquerque and Ricky Taylor very close together in a heated battle for second. Juan Pablo Montoya was closing in too on that pair and pulling away from Nasr who was keeping clear of a battling Spencer Pigot (#55 Mazda) and Ryan Hunter-Reay. A fumble from DHH saw him stop in the wrong pit stall and slightly delay the pitting #912 Porsche of Earl Bamber – The Porsche man seeming to bump the Lexus out of the way with three less than gentle contacts from the rear encouraging the Dane to move forward! The penalty when out come went to the #15 for “pitlane protocol violation” Sean Rayhall now aboard the car served the penalty immediately. The explanation from Porsche is that the Lexus stalled and the Porsche tried to assist a bump start! It worked! Full Course Yellow 5 came out with less than 20 minutes to go until halfway, Dominik Baumann trying to get the #14 Lexus back to the pits with what appears to be failed hood fasteners, the limited available visibility seeing the Lexus collecting a pair of advertising hoardings. 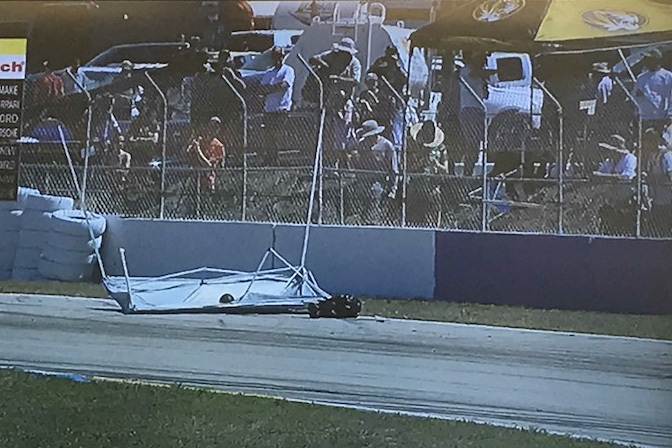 He managed to (literally) shake them off but the debris hazard caused buy a high end sponsorship logo on track rather than by it saw the caution called. Baumann managed, rather slowly, to bring the #14 to pit lane and happily only a pair of new pins were required. Under the caution all of the leading cars in all classes pitted but as the halfway mark passed it was still Derani in the #22 from Ricky Taylor in the #7 Acura and Spencer Pigot now in third in the #55 Mazda! In GTLM Connor de Phillippi in the #25 BMW led from Toni Vilander in the Risi Ferrari and Nick Tandy in the #911 Porsche. GTD meanwhile got to halfway with Luca Stolz leading in the #33 Riley AMG ahead of Corey Lewis in the #48 Lamborghini second and Gunnar Jeannette in the #63 Ferrari third.